Disclaimer: I have teamed up with S.O.S® Non-Scratch Scrubbers in support of this campaign. We received compensation for participation in this campaign. However, all thoughts and opinions are my own. S.O.S® Soap Pads have been around for almost a century, taking the elbow grease out of scrubbing burnt-on, crusty, greasy pots and pans. These soap-filled, steel wool scrubbers can tackle an evening’s worth of dishes in no time. But steel wool isn’t recommended for use on all surfaces – it’s too abrasive for more delicate surfaces like non-stick, enamel and anodized cookware. So to make sure no one is denied the scrubbing power of S.O.S, their experts have come up with a new product that’s safe to use on all surfaces – new S.O.S Non-Scratch Scrubbers. S.O.S® Non-Scratch Scrubbers are made from synthetic scrubbing fibers (rather than steel wool), so they are soft in your hands and safe to use on non-stick coatings and other delicate surfaces. These gentle-touch scouring pads have the same soap that people have trusted for almost 100 years built right in, so you just wet the pad and scrub. How simple is that? From cheese to onions to ground beef – we’ve all had food defy the term “non-stick” and scorch itself defiantly to a non-stick pan. 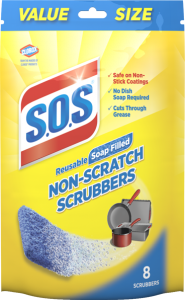 But S.O.S Non-Scratch Scrubbers are here to help, offering the trusted scrubbing power of S.O.S® in a brand new pad that’s completely scratch-free. The reusable scrubbers also come in handy for other delicate items like crusty casseroles on fine china, lipstick stains on delicate stemware…the list goes on! S.O.S® Non-Scratch Scrubbers are now available in 4-count and 8-count packs at select grocery stores and mass retailers nationwide. Click here for more information on these new cleaning powerhouses. P.S. For cleaning tips & tricks and more, be sure to like S.O.S on Facebook and follow them on Twitter! Click here to Like SOS Clorox on Facebook. Click here to Follow SOS Clorox on Twitter.